MetroCare Hawaii, PLUS is a Private Duty Home Care Agency in the Aloha State with offices in the Big Island of Hawaii, the island of Oahu and the island of Maui providing invaluable services to our elderly and disabled citizens within the various communities. Our staff are a group of compassionate, caring and dedicated professionals whose skills and experiences are comprehensively screened. 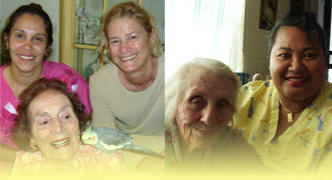 They possess the attitude and personality needed to provide quality care for you and/or your loved ones. They also go through periodic in-service training to hone their skills to assure that your expectations are met. Our care professionals are not only trained and supervised, they are also bonded and insured, assuring you... Peace of Mind. Your opinion counts. Please tell us your evaluation on the services we provide. Your feedback is golden to us because this makes us better at what we do. Please participate in our survey. Are you looking for related information? How about the latest on healthcare from government agencies and organizations? We can make your search easier. Try these links which might help you. In pursuit of excellence, MetroCare Hawaii, PLUS aims to become the leading home services provider in Hawaii. We deliver our services with respect and professionalism.